La Terrazza has whitewashed walls, wooden beams and a delightfully romantic vine-covered terrace which is completely enclosed. In late August/September you can lean out of the bathroom window to pick the grapes! There is a pretty master bedroom, furnished with hand-made Umbrian fabrics and with bathroom leading off it, and a smaller bedroom, with bags of character, leading off the kitchen/living room. Outside the main accommodation area is an old stone-walled cantina, which would once have been used for storing wine and curing hams, and has now been converted into a reading/play room and provides extra space for the dishwasher, washing machine and second fridge. In the heat of the summer, this is the coolest spot in the entire property. It is also perfect as an extra third bedroom for teenagers or extra guests, with a fold-out bed available on request. The accommodation has central heating, so is cozy in winter, with a log fire in the living room. San Mamiliano is a tiny medieval hamlet in the breathtaking Valnerina area of southern Umbria, far off the beaten tourist track, yet within easy reach of the main sites. 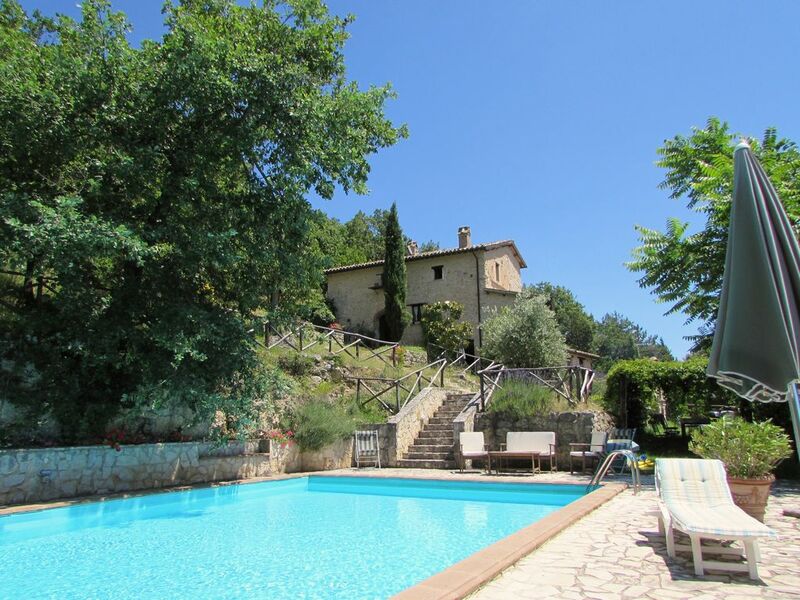 Holiday rental is available of part of a typical Umbrian 'casale', a splendid villa which probably dates back to the 16th century, and possibly much further. The accommodation for rent comprises two self-catering apartments, restored to a very high standard. The upper part of the house is our much loved holiday home, where we spend most weekends and part of the summer. The house is set in its own extensive grounds, just outside the village. Guests have the use of all the grounds, including a romantic private vine-covered terrace for La Terrazza, and a lovely belvedere looking out over the valley, for La Loggia. The property has an unusually large swimming pool, with stunning views over the surrounding hills and valleys. Particularly suitable for two families or groups of friends. It also has an outdoor pizza oven by the pool, which is a lot of fun and makes really excellent pizza, as well as bread and slow cooked food overnight. A year round holiday choice: This beautiful and unspoilt corner of Umbria has something to offer all year round. You can roast chestnuts by the fire in Autumn, eat new olive oil (and watch it being made) on bruschetta in Winter, pick wild asparagus from the hillsides in Spring and have barbecues round the pool in Summer (lit for night-time swims). The stars are exceptional, with a good chance of seeing shooting stars in Summer. A pair of eagles nesting in the craggy valley of the Valnerina have been spotted from the deck of the pool on several occasions. Away from the crowds: San Mamiliano is tucked away in a hidden corner of Umbria. Here, you won't find coach loads of tourists. Nor will you find yourself sitting next to other holidaymakers when you eat out at the excellent country trattorias, of which there are a number within easy reach. There are spectacular walks and horse riding, tennis, canoeing and white water rafting (including some descents suitable for children) all available nearby. There are also many little known local treasures, which the owners will be glad to point out. These include the highest waterfalls in Europe, an exquisite 7th century frescoed abbey and several abandoned hilltop villages, which can be reached on foot and are idyllic spots for a picnic. A warm welcome: San Mamiliano is the perfect place for a family holiday, and children will receive an especially warm welcome. But it is also a very romantic setting, and an ideal place to chill out and de-stress. When Italian-English owners Mario and Clare are in residence (most weekends and the summer), we do our best to give guests all the space and privacy they want. But we are also happy to help out in any way, by pointing out special places to visit, booking trattorias or advising on the best places to buy good local products such as olive oil and truffles. Clare will be happy to take guests horse-riding on the beautiful mountains nearby, while Mario is always pleased to chat about one his favourite subjects -- wine. Although the pool is shared, it is an unusually large one, with plenty of room in and out of the water. Many of our guests return year after year. I have written a book about my adventure buying and doing up a ruin here in Umbria, and all that it led to. It’s called Chickens Eat Pasta and I'm told it's quite a good read. It's certainly very different now from when I bought it all those years ago! You can find details here: http://www.troubador.co.uk/book_info.asp?bookid=3313 There’s a special 10% discount (quote this code: UMBRIA when you order) for my friends if you buy it from the publisher Troubadour. Please don't buy it through Amazon if possible, as they take 65% of all royalties! For anyone outside the UK, you might also want to consider buying it through the Book Depository, as they ship free worldwide. See http://www.bookdepository.com/Chickens-Eat-Pa…/9781784623517 Guests who come to stay can purchase a copy here, and of course I'll sign it. I hope you like it! This part of Umbria is stunning in Spring and Autumn too and we offer guests a warm welcome year-round. There are wild asparagus, orchids and nightingales in March, April, May and June and glorious colours in the foliage in October and November. Ask about out special offer packages which can be tailored to suit and can last just a few days or more. They can be based on self-catering or B&B, with optional dinner. These breaks may include spectacular walks (self-guided or with guide) to abandoned hill villages or mountains with 360 degree views, complete with delicious picnic provided. We can also offer horse riding and even cooking lessons from a Spoleto chef who will teach you how to prepare a meal based on local ingredients, including fresh pasta and truffles (you can agree the menu together), which you will then eat with superb local wines. The property has two double bedrooms, but the larger room can be converted to a twin if necessary, and there is room for a third single bed for families with children, if required. The bathroom leads off the main bedroom. On request, the reading room can be converted to a third bedroom for teenagers or extra guests. This part of Umbria is stunning in Spring and Autumn too and we offer guests a warm welcome year-round. Ask about out special offer packages which can be tailored to suit and can last just a few days or more. They can be based on self-catering or B&B, with optional dinner. These breaks may include spectacular walks (self-guided or with guide) to abandoned hill villages or mountains with 360 degree views, complete with delicious picnic provided. We can also offer horse riding and even cooking lessons from a Spoleto chef who will teach you how to prepare a meal based on local ingredients, (you can agree the menu together), which you will then eat with superb local wines. San Mamiliano is an excellent base to explore all the main sites in Umbria (Spoleto 20 mins/Assisi/Perugia/Todi/Orvieto 40 mins) and then retreat to peace and quiet at the end of the day. It is too small to feature on most maps. The nearest bigger villages are Ferentillo and Montefranco. The house can be reached in approx. 1.5 hours by car from Rome, 2 hours from Ancona or Pescara, or just 40 minutes from Perugia, serviced by Ryan Air flights from Stansted.